Learn about GoAnywhere MFT’s PGP encryption software. GoAnywhere's Open PGP-compliant encryption addresses the privacy and integrity of the data you exchange with external trading partners, clients, customers, vendors, and internal users. Open PGP is an encryption standard. It uses asymmetric (public key) cryptography and addresses the issues of data authentication and non-repudiation through the ability to "sign" files via embedded digital signatures. These features give organizations a high level of data protection, making PGP one of the most popular encryption methods used today. With GoAnywhere, you can implement Open PGP encryption for your files on multiple platforms, including Microsoft Azure, Microsoft Windows, and Linux. Detailed audit logs help you track your encryption processes and comply with industry regulations. After encrypting files with PGP, GoAnywhere MFT can place them on the network or transfer them to a remote server. With GoAnywhere's advanced workflows, this process can be automated from end to end. For example, a project workflow could be defined to automatically retrieve records from a database, create a CSV file from those records, encrypt the file, and send it to your trading partner's SFTP server, all without manual interference from you or your team. GoAnywhere MFT's PGP encryption and decryption processes have been verified for interoperability with many other PGP and Open PGP products, including GPG (GnuPG). 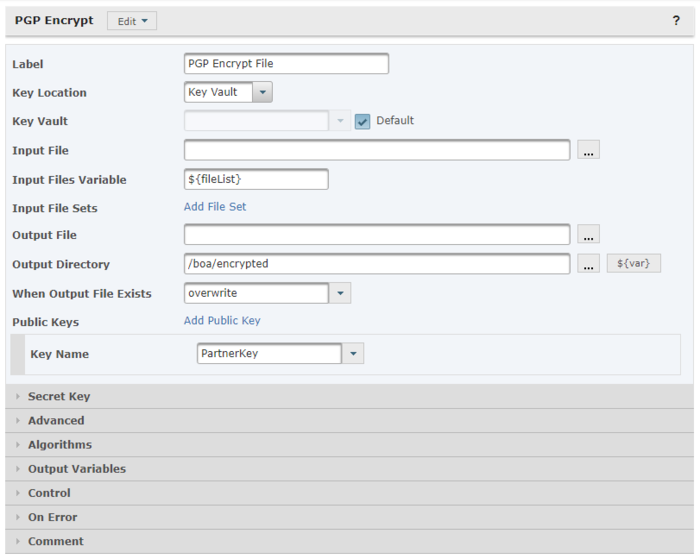 A comprehensive Key Manager is provided in GoAnywhere MFT to allow for the management of PGP public and private keys. This Key Manager can be used to create keys, change keys, view keys and import keys. 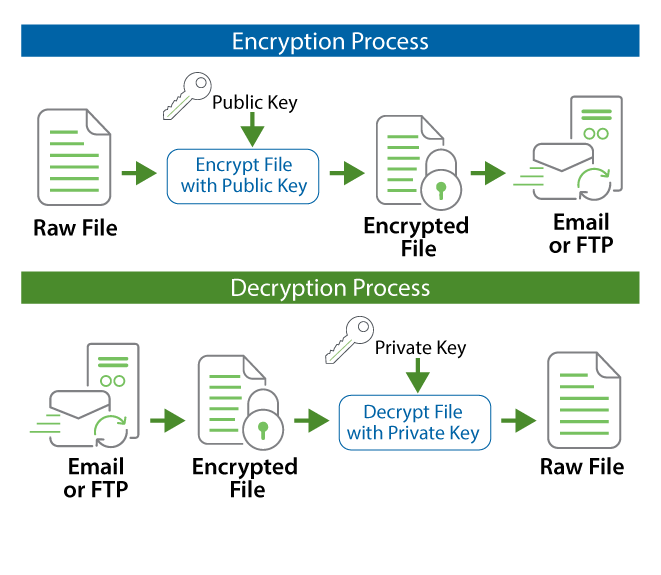 These keys can be utilized within GoAnywhere MFT for automating PGP encryption and decryption within your organization. This Key Manager can also be used to export public keys for sharing with your trading partners. GoAnywhere MFT is compliant with the Open PGP encryption standard. The Open PGP standard is a non-proprietary and industry-accepted protocol which defines the standard format for encrypted messages, signatures and keys. This standard is managed by the IETF (Internet Engineering Task Force). See RFC2440 and RFC4880 for more details on this standard. The key sizes supported are 512, 1024, 2048 and 4096 bits. The default symmetric algorithm is AES-256, which can be changed by the user. The default hash algorithm is SHA1, which can be changed by the user. * PGP is a registered trademark of PGP Corporation. 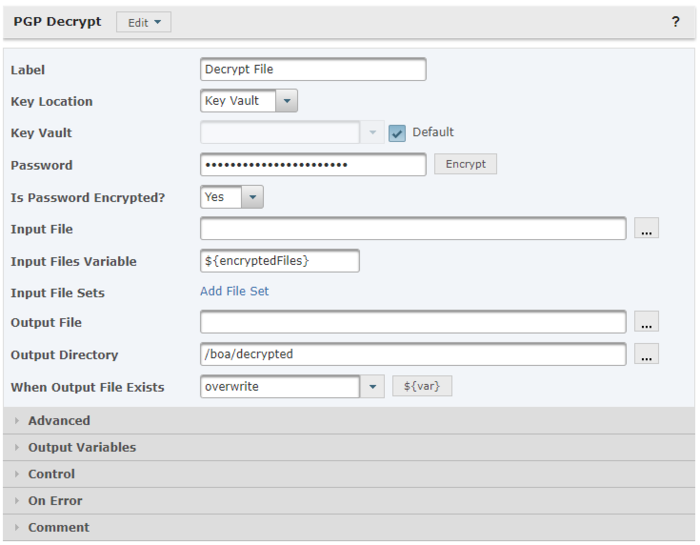 Request a quote to automate file encryption using GoAnywhere MFT's PGP software.